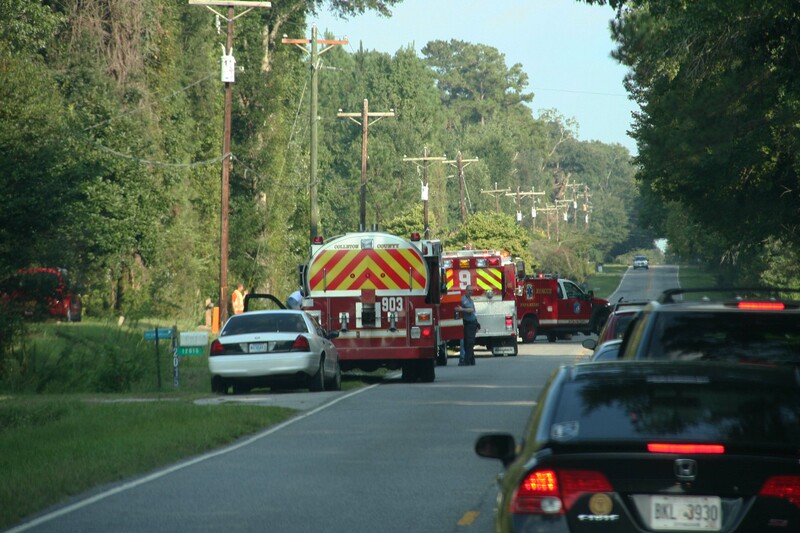 Stations 19 and 26 responded with Walterboro Public Safety to an auto/pedestrian accident at the intersection of Wichman Street and North Lemacks Street Thursday evening 30-September at 2035. 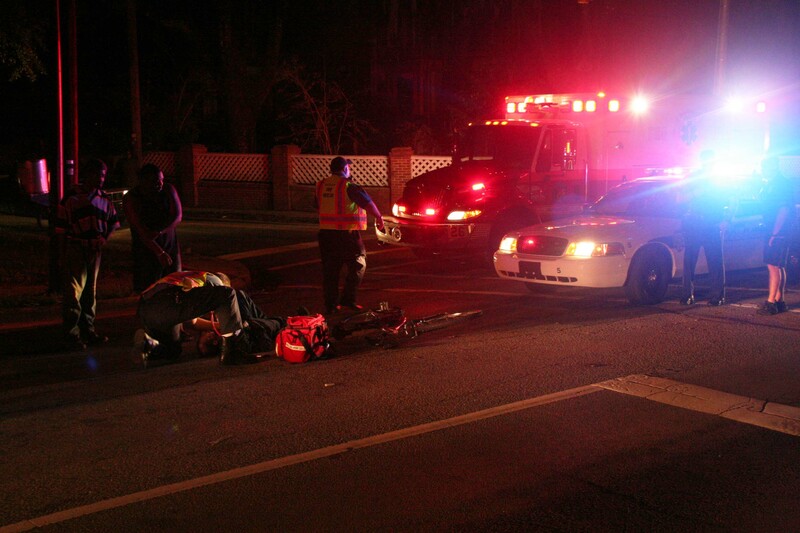 An adult male on a bicycle entered the intersection, collided with a pickup truck and fell to the ground striking his head on the pavement. Click here for additional information. 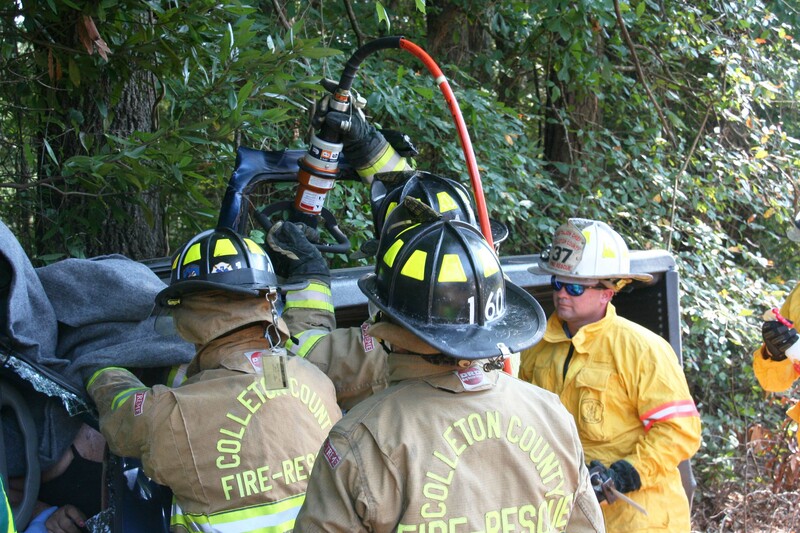 Anyone interested in attending the Auto Extrication class scheduled for November 6 & 7, 2010 forward a signed SCFA application to the training division by Tuesday, October 5th, 2010 at 17:00 hours. The Course Code is 3330-11503 and there are several spots still available. If you have any questions, please contact the training division. 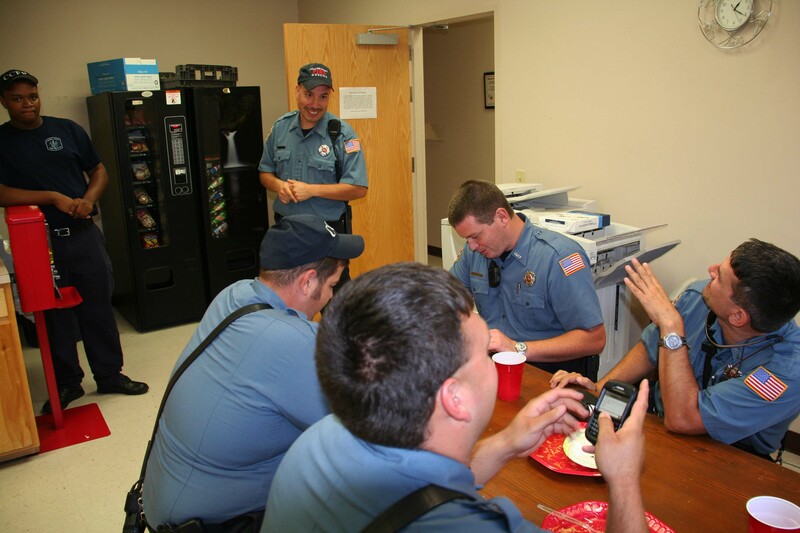 Tactical Response Team training will be held on Saturday October 2, 2010 at 0830 hours at Station 19. The topic will be Hazardous Materials Response. The 29th annual National Fallen Firefighters Memorial Weekend will be held at the National Fire Academy in Emmitsburg on October 2-3, 2010. A plaque with the names of 80 firefighters who died in the line of duty in 2009 will be added to the National Fallen Firefighters Memorial. Military firefighters who died while performing firefighting duties from 1981-2009 are among 25 from previous years who are also being honored. Colleton County Fire-Rescue is honored to broadcast the 2010 National Fallen Firefighters Candlelight and Memorial Services being streamed live via the web. Click here to view the services. Stations 17 and 26 responded to a two vehicle MVC in the 4100 block of Sunrise Road Tuesday morning 28-September at 0719. 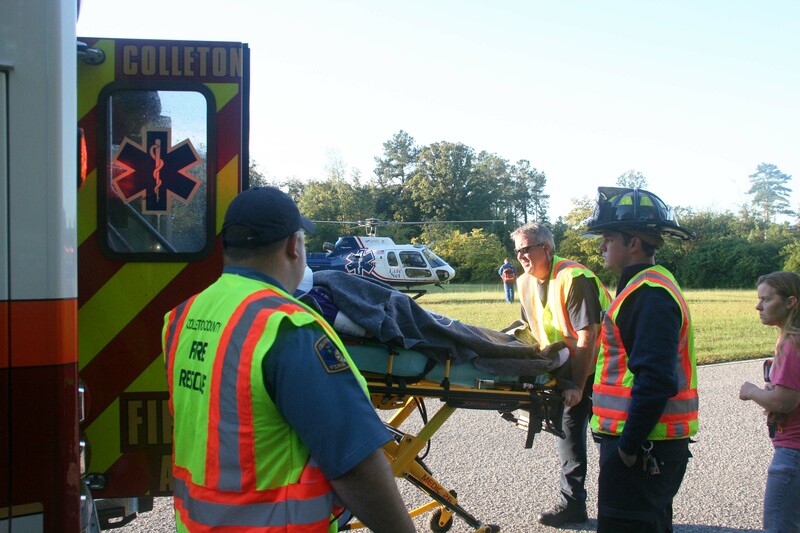 An off-duty Firefighter-Paramedic arrived within minutes to find a Mercury Mountaineer that had collided with a tractor trailer hauling logging equipment. The small SUV suffered heavy front end damage.... click here for additional information. Our condolences, thoughts and prayers go out to Battalion Chief Dan Barb and his family for the loss of Dan's Father, a retired Arlington (VA) Firefighter, who died last night (9/23/2010) at 22:21. 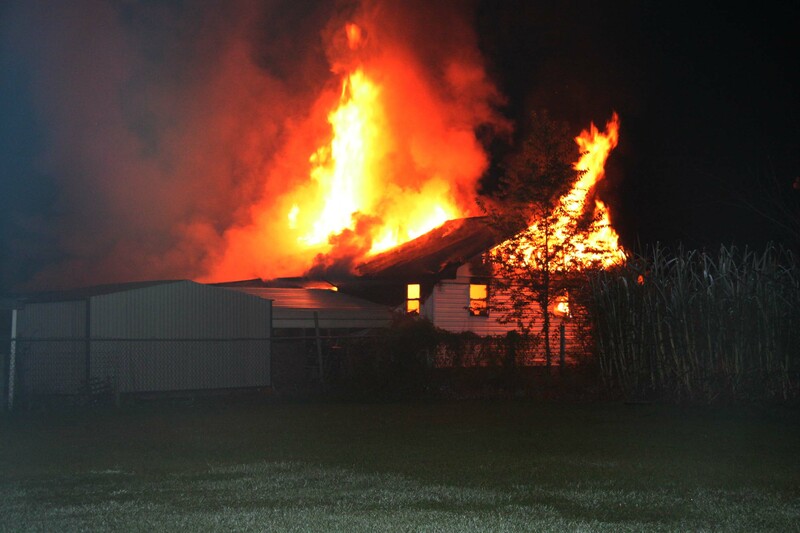 Stations 1, 19, 24 and 26 responded to a structure fire at 90 Gentry Lane Thursday evening 23-September at 2350. The first Fire-Rescue unit arrived within 6 minutes to find the building approximately 70 percent involved. Engine 26 dropped 600 feet of 3 inch supply line from a hydrant on the corner at Heirs Corner Road. 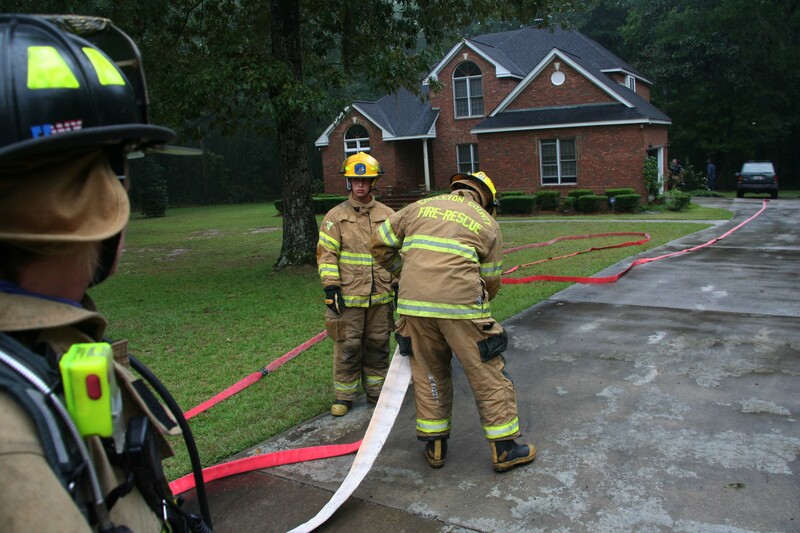 Firefighters deployed one 2-1/2 handline and two 1-3/4 handlines to combat the fire. Click here for additional information. Stations 1, 19 and 26 responded to a structure fire in the 200 block of Ivy League Drive, Thursday morning 23-September at 0959. 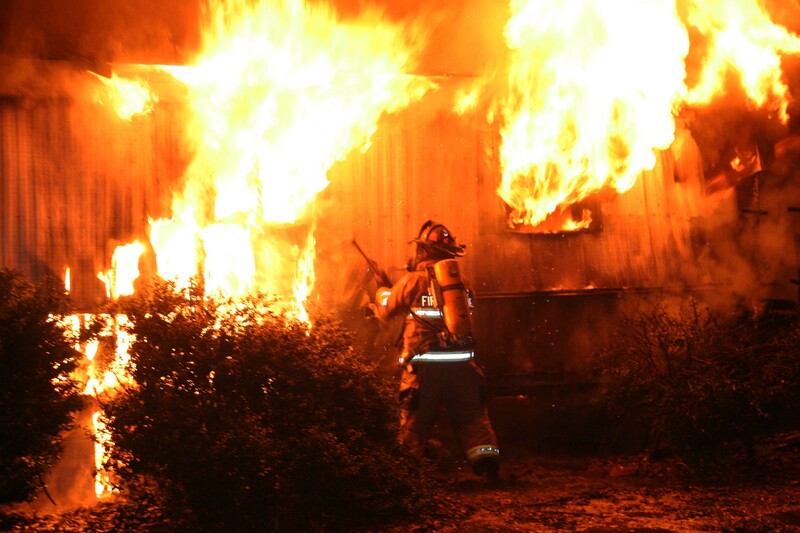 Units were originally dispatched to a singlewide mobile home with smoke and flames showing in the Wiggins Trailer Park located at 117 Taylor Street. While enroute to Taylor Street, units located a well involved doublewide mobile on Ivy League, two blocks away. Click here for additional information. Stations 5, 17, 19 and 26 responded to a structure fire at 6222 Augusta Highway at 0600, Thursday morning 23-September. Engine 26 arrived to report a two story wood frame dwelling 100 percent involved. The building was located about 200 feet off of the roadway on a rural stretch of highway and had been burning for some time. Access to the property was blocked by steel cables across the driveways. Click here for more information. Station 1 responded to a high speed single vehicle MVC on I-95 at the 52 mile marker southbound, Wednesday afternoon 22-September at 1522. A southbound GMC Sonoma Pickup truck suffered a rear tire blowout causing the vehicle to lose control and enter the median. The truck rolled over at least once coming to rest against a large pine tree. The roof sustained heavy damage. Click here for additional information. 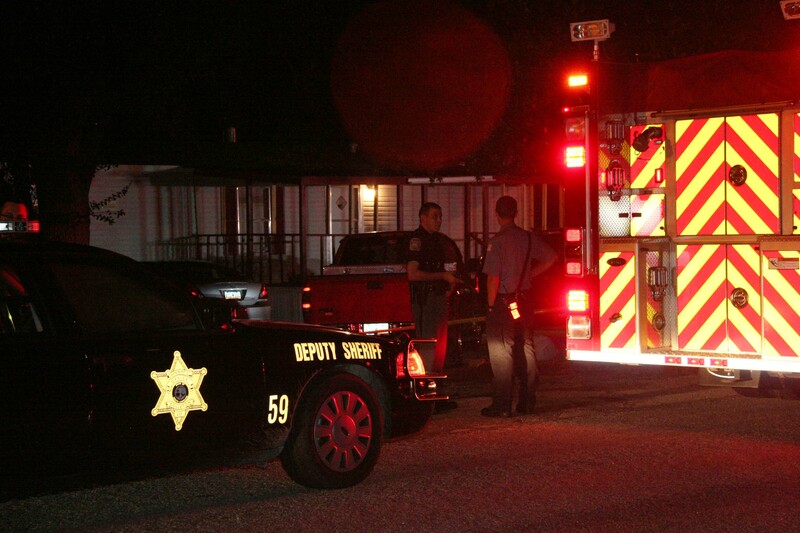 Stations 1 and 6 responded to a double shooting incident at 1051 Whitehall Road at 23:52 Saturday evening 18-September. Sheriff’s Deputies arrived ahead of Medic 6 and advised both subjects did not appear to be breathing. Battalion 1 arrived at short time later and verified that both patients were deceased. The patients, an adult female and an adult male, were found in the front yard of the residence. Click here for more information. 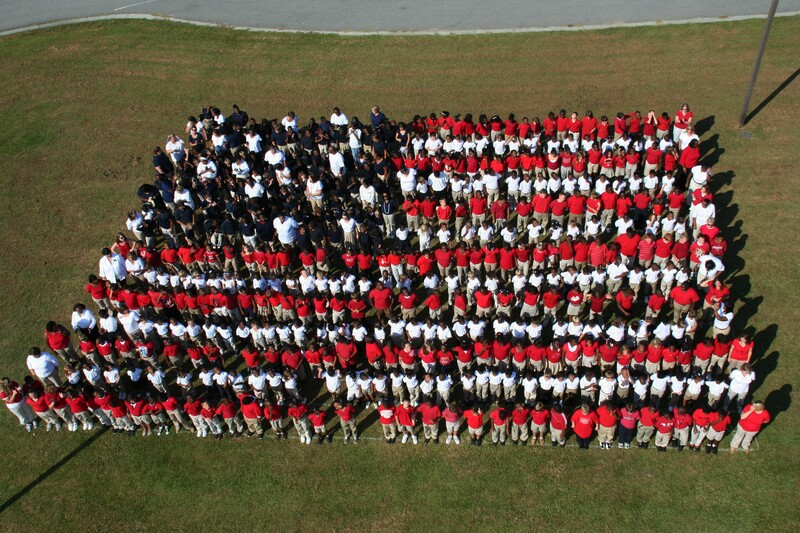 Ladder 6 assisted the Hendersonville Elementary School photograph their human US Flag. The entire student body and teachers participated in the event to honor the anniversary of our National Anthem. The students spent about 30 minutes assembling on the grass in the bus parking area. Each class wore a different color shirt, depending on the area of the flag they were forming. Click here for additional information. Stations 1, 4, 7, 10, 18 and 23 responded to a single vehicle high speed MVC on Merriel Road near Williams Road Sunday evening 12-September at 1922. 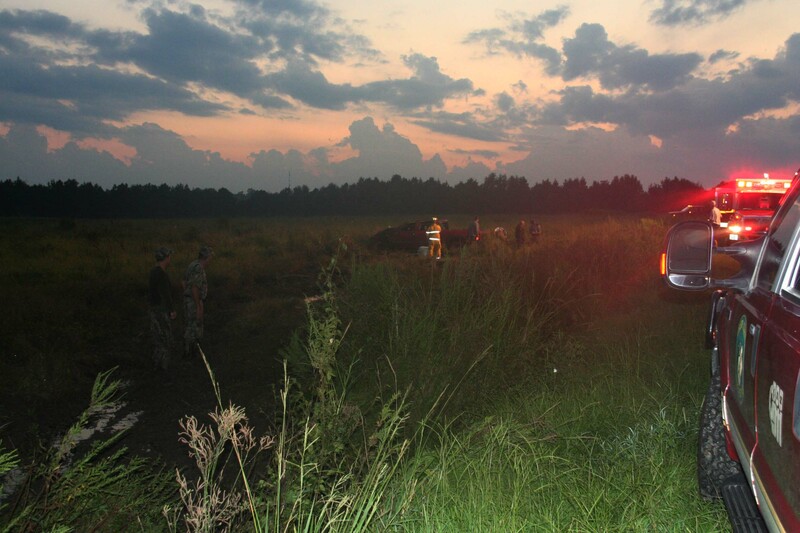 The newer model Chevrolet pickup truck failed to negotiate a curve, went down an embankment and overturned multiple times before coming to rest upright in a field. Click here for additional information. Stations 2, 9, 11 and 19 responded to a kitchen fire at 12073 Cottageville Highway at 1700, Sunday afternoon 12-September. Engine 9 and Medic 9 arrived to find no visible signs from a singlewide mobile home on the property. Crews found light smoke inside the structure, which was the result of a grease fire on the stove. The fire had spread to combustibles on the counter and ignited a rug on the floor. Click here for more information. Bobbi and Arnold Greene prepared their annual lasagna dinner for the on-duty personnel who were working September 11th and a training class that was taking place at Station # 19. This is the ninth year they have provided the meal in remembrance of the events surrounding the terrorist attacks on our country. Click here for additional information. 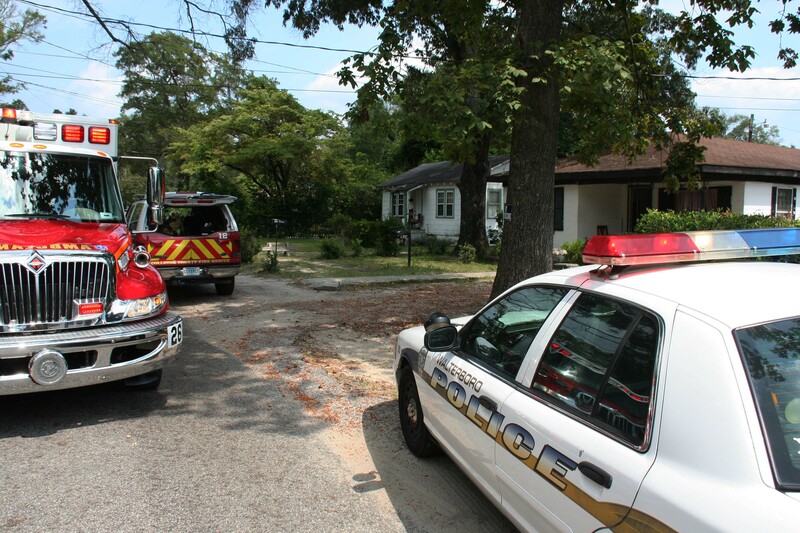 Stations 1, 6, 19 and 26 responded to a structure fire at 40 Chandelier Drive Saturday afternoon 11-September at 1517. Light smoke was found inside the building on arrival. Crews deployed one 1-3/4 hand line to the house. A tree near the residence was struck by lightning during a thunderstorm and the lightning apparently followed the phone lines under the house. Click here for additional information. Stations 19 and 26 responded to a stabling incident at 1024 North Lemacks Street Saturday afternoon 11-Spetember at 1334. An adult male was found standing in the front yard with a stab wound to the left back. He had moderate bleeding. Firefighter-Paramedics from Medic 26 quickly controlled his bleeding & treated the man at the scene.Click here for more info. 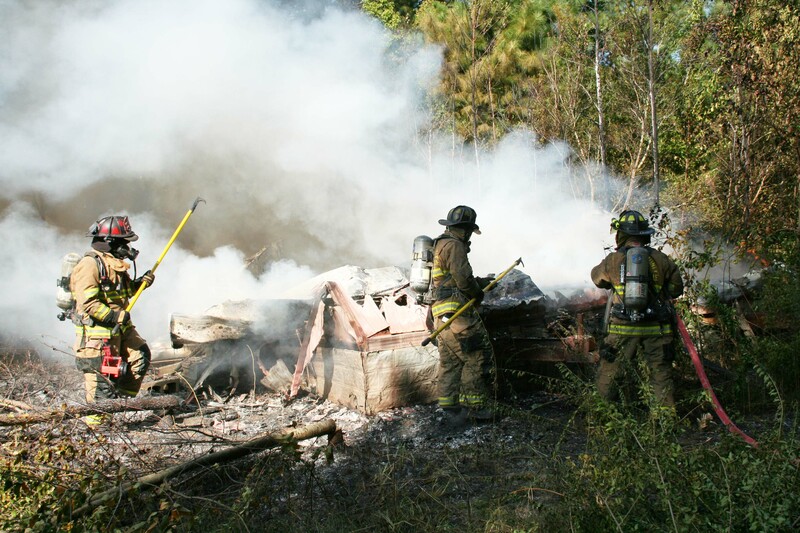 Station 19 responded to I-95 at the 38 mile marker southbound near the Town of Yemassee, as a mutual aid request for Hampton County, Wednesday morning 8-October at 0542. 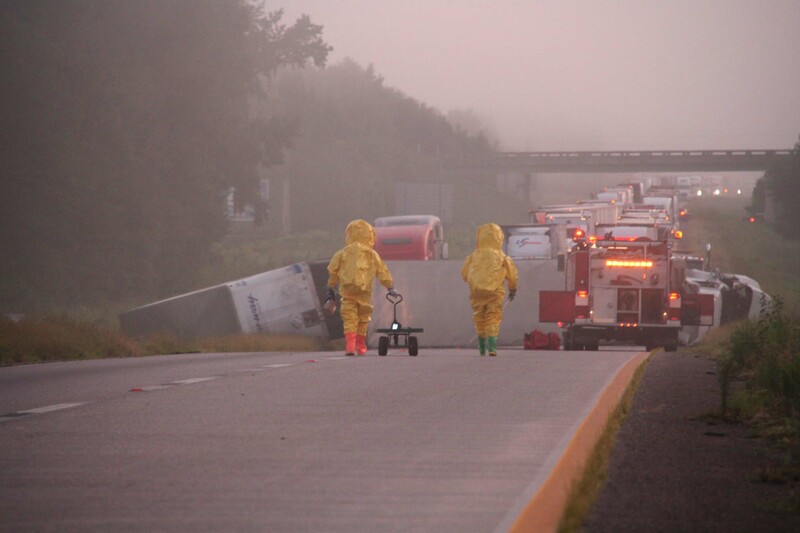 The incident involved an overturned tractor trailer with two trailers. 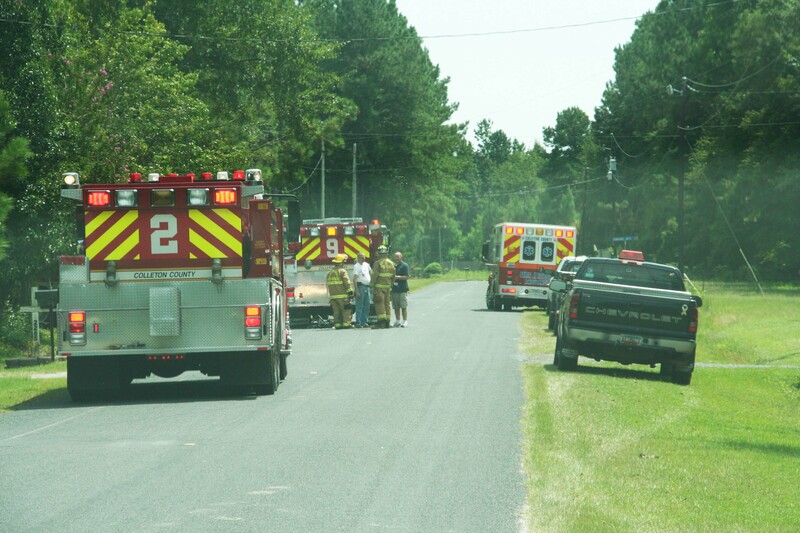 Hampton County Fire-Rescue and EMS initially responded to the incident. Click here for additional information. Stations 1, 4, 7, 15, 18, 19, 26 and 31 responded to a two alarm fire in a single family residential structure Monday morning 6-September at 05:25. Engine 18 and Medic 18 arrived to find heavy smoke conditions, with flames through the roof of the older wood frame building. The single story structure had several additions. Click here for additional information. Stations 9 and 11 were dispatched to a residential fire alarm at 2287 Rhode Drive, Saturday afternoon 4-September at 13:14. Engine 9 and Medic 9 arrived to find light smoke coming from the single story dwelling. The response was upgraded to a full structural response adding Stations 2 and 19. Firefighters quickly found moderate smoke conditions coming from a utility room at the rear of the structure. Click here for additional information. Stations 1, 19, 26 and 27 responded to a structure at 296 Oxford Drive Friday morning 3-September at 11:18. Engine 19, Tender 19, Medic 19 and Car 11 arrived to find light smoke showing from the “D” side of the two story single family dwelling. 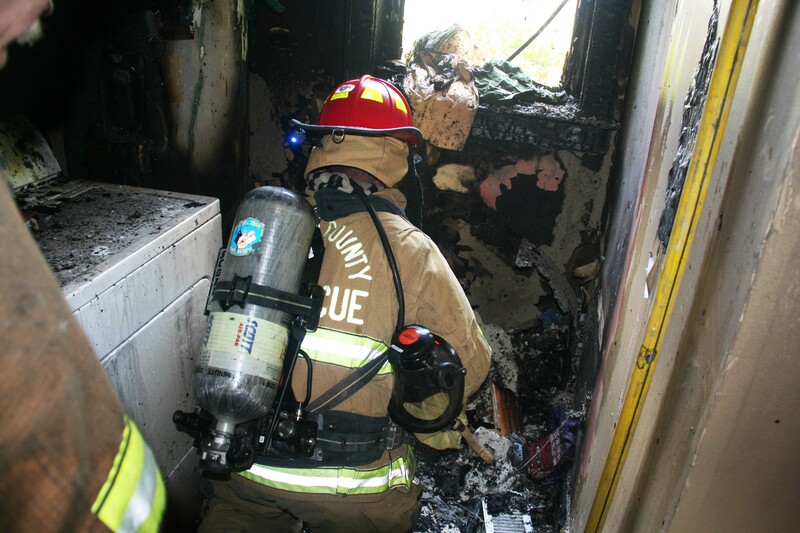 The occupants had already exited the building and indicated the fire was in the utility room. Click here for additional information. 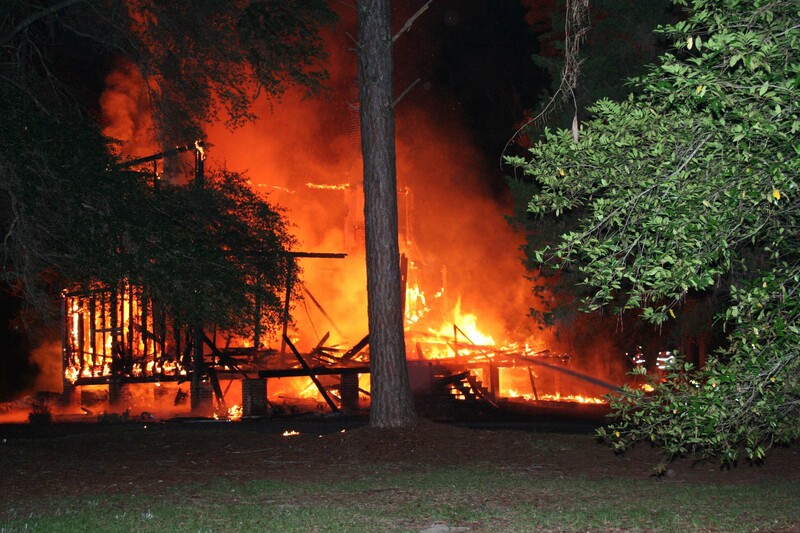 Stations 1, 19, 24 and 26 responded to a structure fire at 2659 Sidneys Road at 1944, Wednesday evening 01-September. Engine 19, Tender 19 and Medic 19 arrived to find heavy black smoke coming from the singlewide mobile home, which was located off the roadway behind a church. 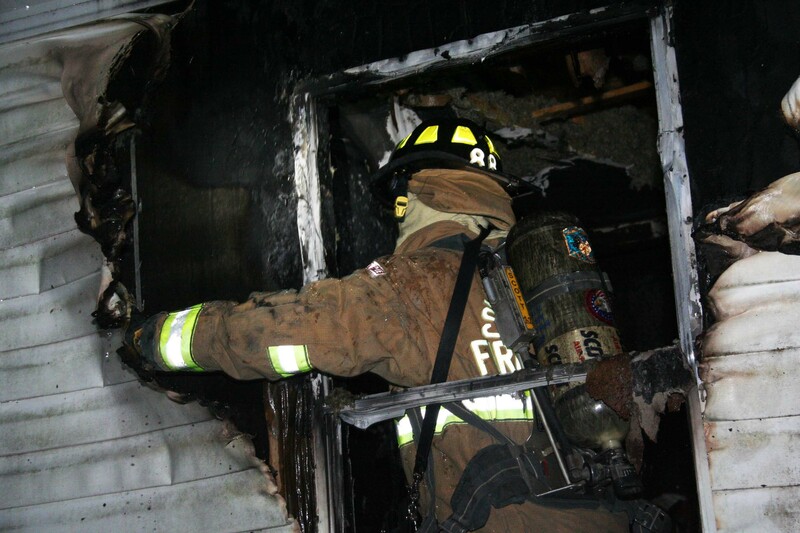 Crews deployed one 1-3/4 handline and found fire extending from a small bedroom near the center of the building. Click here for more information.